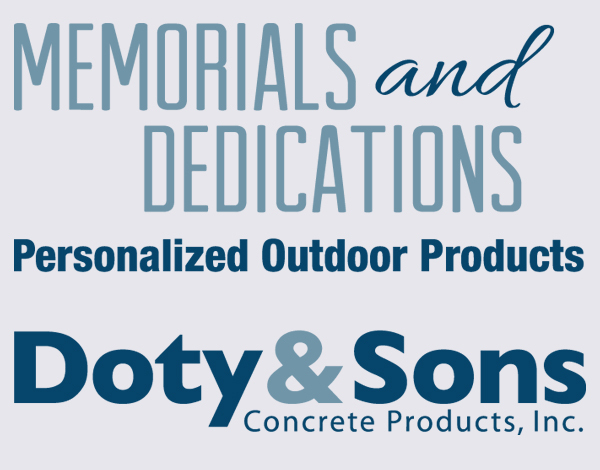 Doty & Sons Concrete Products, Inc. has been in the precast concrete business since 1948. We make top quality products that give years of use and are appealing to the eye. Most of these products are our own design, planned for looks, comfort, strength and durability. Because of their heavy weight, they resist vandalism. Products are made of extra strong 5000 PSI reinforced concrete; the exposed aggregate finish has the stones all the way through, nothing is glued on. Many of the products shown on this web site can be delivered in a short period of time. Engraved benches can be shipped in 3-4 weeks. Products with bronze plaques generally require 6-8 weeks. Expedited shipping available. Please call for details. We can provide different aggregates and finishes to match individual projects. We welcome the opportunity to work with you individually or with your organization, in selecting the item that best suits your needs. DON’T LET FREIGHT COSTS SCARE YOU. We deal with several freight companies that allow substantial discounts for long distance hauling, when freight is prepaid by Doty & Sons. Because of this, we are able in most cases, to pass considerable freight savings on to our customer. Please call for bids.